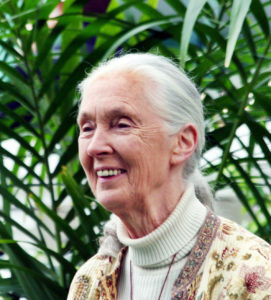 Ask just about anyone to name a famous living biologist, and the answer is likely to be, “Jane Goodall.” Goodall, who studied chimpanzees in Tanzania for half a century, is a hero to people throughout the world, and especially a role model for young women interested in science, research and adventure. Goodall was born on April 3, 1934, in London. As a girl, she loved delighted in nature, spending her free time observing the behavior of animals. She developed two specific loves—animals and Africa. “I got my love of animals from the Dr. Doolittle books and my love of Africa from the Tarzan novels,” she said. Those loves grew stronger as she matured. She completed high school, but did not have enough money to attend college. She worked for years as a secretary and waitress, saving money to afford to go to Africa. She achieved her dream when she accompanied a friend to Kenya in 1957. There she met Louis Leakey, the famous paleo-anthropologist, and began working for him as a secretary and field assistant. Realizing her interest in animal behavior, Leakey sent Goodall to study the vervet monkey on an island in Lake Victoria. Leakey believed that studying primates in nature would yield great insight into the evolution of humans. He thought Goodall would be perfect for the work, because her lack of a college education would make her an accurate observer, un-influenced by theory or current dogma. So, in 1960, accompanied by her mother (local authorities would not let a young English woman travel on her own), she traveled to the Gombe Stream National Park in what is now Tanzania to begin observing chimpanzees. For a long time, Goodall could not get close to the chimpanzees. When she was still hundreds of yards away, they would retreat and disappear. But she kept at it, appearing at the same location and time every day and waiting patiently. Eventually, the chimpanzees came closer and closer, and within a few years, they had accepted her presence among them. She became a neighbor, rather than an intruder. Goodall’s close access allowed her to discover two behaviors that rocked the zoological world. First was the fact that chimpanzees were omnivores, not herbivores, often eating meat that they hunted in groups. Second, and more important, was her observation that the animals made and used tools—specifically, she observed chimpanzees stripping the leaves from twigs, then inserting the twigs into termite nests and then removing them to eat the insects that had climbed aboard. Goodall’s work became widely known, but Leakey knew she would not be considered seriously without academic credentials. So, at his insistence, she enrolled at Cambridge, earning her PhD in 1965. Hers was a remarkable achievement, becoming one of only a handful of Cambridge students who earned a doctorate without a bachelor’s degree beforehand. And, of course, those convictions have now become the core of animal behavior studies the world around. Scores of scientists have followed in Goodall’s footsteps, using her patient observational techniques to study gorillas, orangutans, lions, elephants, wolves and countless other species. Biography.com. Jane Goodall. Available at: https://www.biography.com/people/jane-goodall-9542363. Accessed April 3, 2018. Jane Goodall Institute. About Jane. Available at: http://www.janegoodall.org/our-story/about-jane/. Accessed April 3, 2018. McKie, Robin. 2010. Chimps with everything: Jane Goodall’s 50 years in the jungle. The Guardian, 26 Jun 2010. 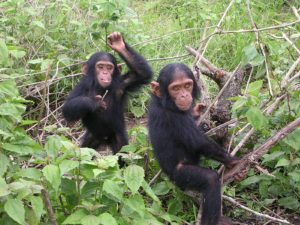 Available at: https://www.theguardian.com/science/2010/jun/27/jane-goodall-chimps-africa-interview. Accessed April 3, 2018.